Portfolios or stand-alone workspaces: which is right for your context? At its core, ScrumDo is a platform designed to ease and improve how teams organize, manage and collaborate on delivering work. Though it was originally designed for software development teams using Scrum (a management and control process that eases the complexity of building software), it has grown into an extremely adaptive and robust platform that can be leveraged to improve the way teams and organizations work under any work management framework. ScrumDo workspaces are the containers we designate to logically organize and manage the work produced by a team or organization. Ideally, you want your ScrumDo workspaces to represent visualizations of the end-to-end delivery “systems” in your organization. But don’t worry if you’re not sure what this means or where to begin -- there’s no “right” or “wrong” way to start, and there are a variety of ways we can help you get to an “ideal” structure over time. 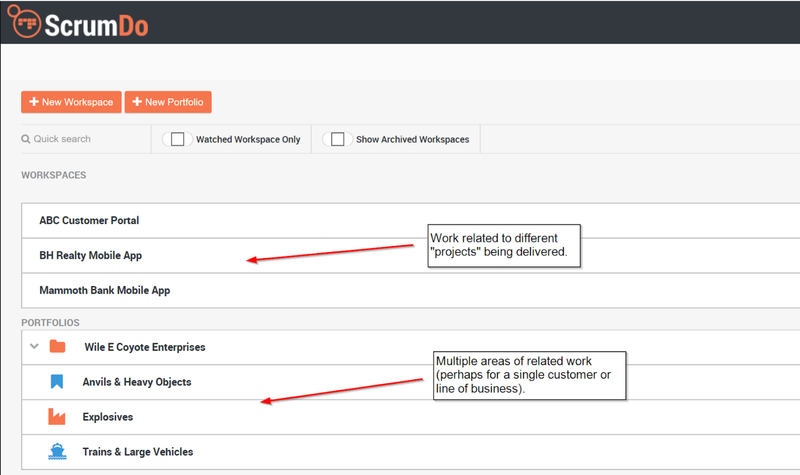 ScrumDo allows customers to define and organize their workspaces in whatever structure makes sense to them (NOTE: ScrumDo's full set of workspace capabilities are only accessible to Premium and Enterprise plan customers). In simple contexts (like a single team or small organization), workspaces will often represent a single body of work -- a “project” or the work produced by a single delivery team. Each workspace in ScrumDo will have its own visual board, with much of your daily activity revolving around the view into the flow of work this provides. These visual boards typically contain lanes (rows) and columns (or individual cells) representing different phases of activity or states. An activity or state may be anything that adds value, discovers knowledge, reduces risk etc. Cards representing a collection of work move across the board as that work passes through these different states. Customers are free to design their visual boards in whatever way makes sense for them, but we do provide a wizard that can get you started with some default designs. There are a whole host of factors that should drive design -- far too many for us to cover here (our Lean-Agile trainers & coaches have days of material on this). In the end, we recommend getting started by selecting a single team or single project at first, then expanding your use and leveraging of the platform’s capabilities over time.